This is the original rendering of the American Revolution Center. A group that for years has been trying to build a Revolutionary War museum within the boundaries of Valley Forge National Historical Park is moving the multimillion-dollar project to downtown Philadelphia. Officials with American Revolution Center and the National Park Service on Wednesday said they have reached an agreement to open the museum on the site of a former visitor center in Independence National Historical Park, near Independence Hall, the Liberty Bell and other historic sites. In exchange, the Revolution Center is turning over a 78-acre parcel of private land it owns at Valley Forge to the Park Service. It has not been determined whether the Revolution Center will use or replace the existing building, which dates from the 1976 Bicentennial and now houses classrooms and archaeological demonstrations, spokesman Topper Ray said. American Revolution Center organizers had said the project would offer a long-overdue resource for teachers, students, history buffs and scholars of the Revolutionary War. "We have expended extraordinary time and resources to locate the center in Valley Forge, and I believe that our vision there could have been achieved," said Revolution Center board chairman H.F. "Gerry" Lenfest. "We now believe that it is in our best interest to begin a new chapter for ARC, and I cannot think of a more appropriate setting than at Independence National Historical Park in Philadelphia," Lenfest said. The Park Service, some neighbors and preservation groups long argued that the Valley Forge development was too commercial and would diminish the landscape and history of the encampment 22 miles northwest of Philadelphia where Gen. George Washington's soldiers endured the bleak winter of 1777-78. "This agreement will allow visitors to enjoy the museum on an appropriate site in a historically rich area, while also protecting the historic landscape of Valley Forge National Historical Park for our children and grandchildren," said Tom Kiernan of the National Parks Conservation Association, an independent advocacy group that opposed building the museum there. Interior Secretary Ken Salazar called the agreement announced Wednesday "wonderful news" for both sides. "Visitors to our nation's birthplace will now be able to enjoy a world-class museum dedicated to the story of the American Revolution within the shadow of Independence Hall," Salazar said. As early as 1999, the National Park Service and the Revolution Center were collaborating on plans for a museum next to Valley Forge's welcome center near the main entrance. In 2005, however, the museum group announced plans for its own museum and conference center two miles away from the welcome center on private land, across the Schuylkill River from Washington's headquarters during the encampment at Valley Forge. Plans had called for a 90,000-square-foot museum by architect Robert A.M. Stern. 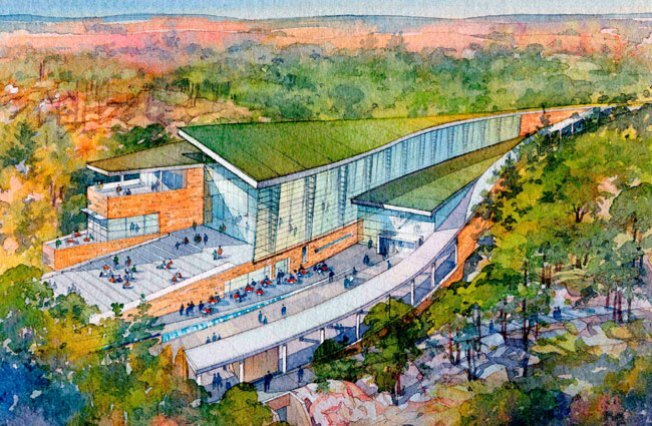 A proposed conference center to include classrooms and lodging was put on hold.